Those who live near rivers in our metro area are fortunate to live alongside one of the world’s most amazing bird migratory routes: The Mississippi Flyway. Every year, over 325 bird species migrate from their breeding grounds in Canada to their wintering grounds in the Gulf of Mexico, and Central and South America. 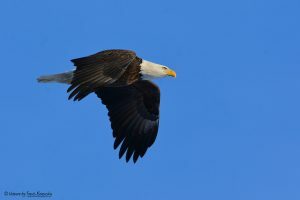 Living within this avian superhighway—about 40 percent of all North American waterfowl use the Mississippi River Valley as a migratory flyway—means great opportunities to spot a wide range of birds in our communities as well as our yards.As we well know, not all birds in our yards are seasonal visitors. 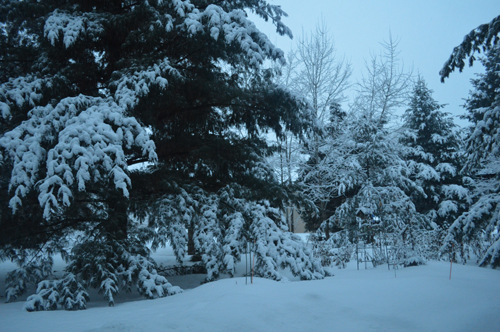 Some birds—such as the chickadee, cardinal, and blue jay—live here year round. Whether sustaining special bird guests as they pass hungrily through our yards, or helping full-time avian residents that rely on our yards year-round, how we care for our yards is surprisingly important to many bird species’ short and long-term survival. While helpful, birdfeeders alone do not a bird habitat make. Ninety-six percent of land birds raise their young exclusively on insects. If a sufficient quantity of insects is not available, birds can’t switch to food from the bird feeder to feed their young. It takes a huge number of insects to raise a single nest of baby birds (called a clutch). A University of Delaware study found that the Carolina chickadee needs to find between 5,000 to 9,000 insects to feed to a single clutch from the time the babies hatch to the time they can fly. Consider how many insects a larger bird might need to feed a clutch of babies. How many clutches of birds does your yard support? The birds in our yards need grasshoppers, crickets, bugs, beetles, caterpillars, moths, flies, spiders, and more to feed to their young. 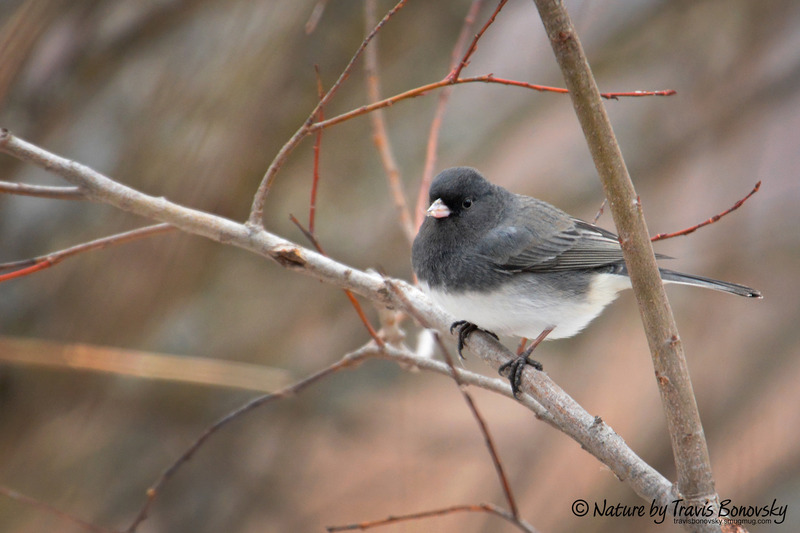 To survive, winter birds need to eat the hibernating critters that are hidden in the leaf litter, twigs, mulch, thatch, tree bark, and other natural debris in our yards. Small birds, such as the hummingbird, rely on spider webs to build their nests. In short: birds need insects, bugs, and spiders to survive. While helpful, birdfeeders alone do not a bird habitat make. Ninety-six percent of land birds raise their young exclusively on insects. If a sufficient quantity of insects is not available, birds can’t switch to food from the bird feeder to feed their young. Consider your yard a part of an important ecosystem. The concept of the hanging birdfeeder is evolving to the concept of transforming the entire yard into a “bird feeder.” Homeowners can make an important contribution to bird survival by supplementing their traditional ornamental landscape plantings with Minnesota native plants (trees, shrubs, flowers, grasses, and vines). 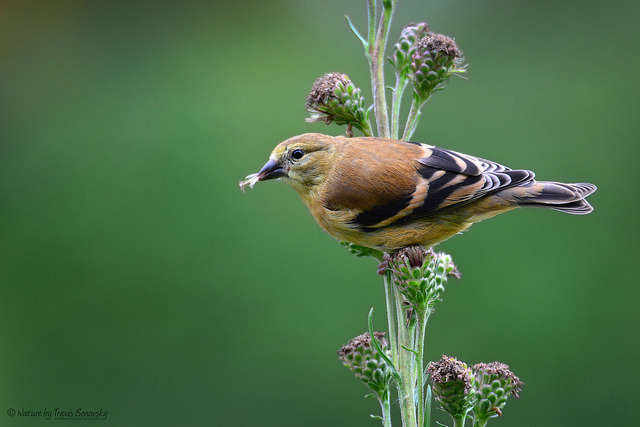 Native plants provide important bird food sources far more robustly than non-natives. 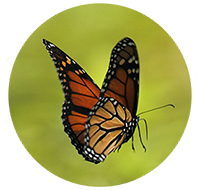 As an example, consider one of the most important insects for bird survival: the caterpillar. Native plants support 35 times more caterpillars (in terms of biomass) than traditional non-native landscape ornamental plants. The majority of insects in our yards are beneficial. And they are the lifeblood of the food chain. According to the National Pesticide Information Center, out of nearly one million known insect species, only about one to three percent are ever considered pests. So, more often than not, insects are not “bad.” Even irritating mosquitoes, pesky boxelder beetles, and bothersome wasps and deerflies play a role in the food chain. It’s just sometimes hard to appreciate their value. When it comes to sheltering and feeding wildlife, Mother Nature does it best. Providing a variety of vegetative layers in your yard will help a variety of bird species. Some birds prefer the tall tree canopy in your yard for food, nesting, or shelter. Other birds forage or nest along the ground. Thoughtful planting of a range of native shrubs, trees, and flowers will provide host plants for insects (which are bird food) as well as a continuous supply of fruits and seeds for adult birds. For example, American plum offers fruits for birds in the summer and is also the host plant for a wide range of insects such as the eastern swallowtail, viceroy, spring azure, and summer azure butterflies. Blackcherry bears fruit in the fall. And the berries of the winterberry can be a food source for birds well into winter. In pondering what you might plant in your own yard, the National Audubon Society offers a great list of native plants for birds by zip code. Birds also need clean water. Your birdbath offers a source of often surprisingly scarce drinking water, as well as a place for birds to take a quick bath—an important aid in keeping feathers healthy. Be sure to clean your birdbath often! 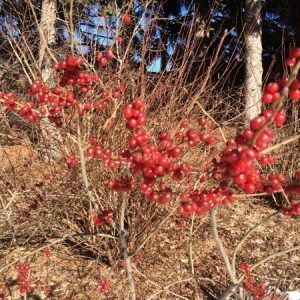 The lovely winter fruit of the appropriately named winterberry (Ilex verticillata), a Minnesota native shrub. Emerging research indicates that native vegetation is more nutritious than non-native vegetation for a wide range of wildlife. In one avian study comparing the nutritional value of native and non-native fruits, the highest fat content and energy densities were found in fruits of native shrubs, which ranged from 6.57 to 48.72% fat and 18.83 to 28.68 kJ/g of energy. In contrast, the invasive fruits had just ≤0.99% fat and ≤17.17 kJ/g of energy. These differences in nutritional value have implications for bird populations. As stated in the study, “Our results suggest that fruits of native shrubs are of greater nutritional value to migrating songbirds than the fruits of invasive shrubs during fall migration, which is supported by the higher removal rates by songbirds of native dogwood fruits than fruits of the 4 other invasive fruit species.” The implications of this for birds can be serious: when natural areas are filled with a monoculture of non-native vegetation such as buckthorn, and residential yards are predominantly landscaped with non-native trees and shrubs, birds can suffer from the lack of proper nutrition.